The series is tied at three games apiece, with Game 7 set for Thursday at SAP Center. The home team has won each of the first six. NASHVILLE – The Sharks got the start they were looking for in trying to close out the Nashville Predators. They even had a third-period lead, too. But Nashville fought back from deficits of 2-0 and 3-2, downing the Sharks in Game 6 at Bridgestone Arena on Monday night in overtime, 4-3. Viktor Arvidsson got the game-winner, corralling a loose puck in the neutral zone and backhanding a shot to the top far corner over Martin Jones’ shoulder at 2:03 of the first overtime. After surrendering a 2-0 lead, the Sharks went back out in front on a third period power play on Logan Couture’s team-leading fifth of the series. He caught a break just before unleashing a wrist shot form the circle, when goalie Pekka Rinne fell over trying to push Joe Pavelski out of the way in front of the crease at 10:04. Nashville answered, though, when Colin Wilson was left all alone in front of the net to easily tap in a James Neal pass at 12:44 to tie the game at 3-3. That’s where it stood until Arvidsson’s winner, the second straight game that went into extra time in Nashville after Game 4 required triple overtime. The Sharks won the first period and the Preds the second, resulting in a 2-2 tie after 40 minutes. San Jose opened up a 2-0 lead on a pair of goals by Chris Tierney. The recently promoted third line center got the blade of his stick on a Marc-Edouard Vlasic floater, and it sailed by Rinne at 9:55. Less than two minutes later, Tierney angled in a loose puck to up San Jose’s lead at 11:55. The play began after Brent Burns whipped it towards the net from the point, and Matt Nieto battled for the rebound. Nieto’s attempt deflected off of Anthony Bitteto to Tierney’s stick blade. The home crowd was zapped of energy, but a Roman Josi goal brought them, and the Predators, back into the game. Cutting to the net, Josi’s shot pinballed around the crease and bounded over the line at 15:27 to cut the Sharks’ lead in half before the intermission. It took just one minute and 25 seconds for Nashville to tie it in the second. During a four-on-four situation, Ryan Johansen fooled Justin Braun in getting around the defenseman before slipping it through Jones for his third goal of the series. The Predators had the edge for much of the remaining time in the second, outshooting San Jose 14-4 in the middle frame. They held a 30-17 shot advantage after regulation, and 32-18 for the game. Nieto did not return after the first intermission. He went hard into the post late in the first period, knocking the net off of its moorings, and was slow to get up. The Sharks are 0-3 in overtime in the playoffs. Black Cat Spotted Skating Before Sharks Game is a Girl! The Sharks and Predators had just one power play each, with both coming in the third period. San Jose converted, and is 6-for-18 in the series, while Nashville did not, and is 3-for-19. San Jose has allowed a pair of four-on-four goals in the playoffs, without scoring any. Jones allowed four goals on 32 shots, moving to 7-5 in his brief playoff career. He has played every minute in goal of every playoff game for San Jose. Rinne needed to make just 15 saves, and is 22-25 in his career in the postseason. 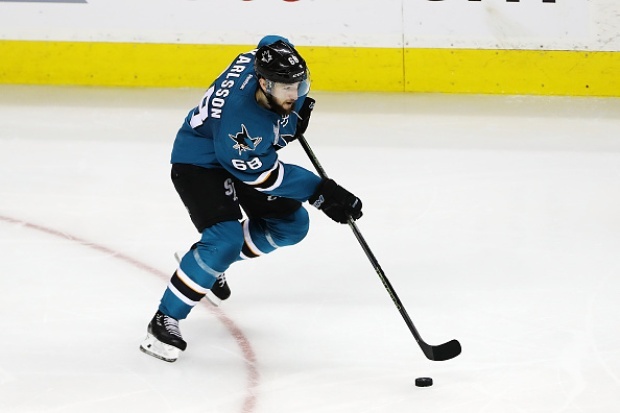 The Sharks’ lineup remained unchanged from Game 5. Dainius Zubrus skated on the fourth line, while Tommy Wingels was a healthy scratch for the second straight game. Vlasic increased his point/assist streak to four games. Wilson has at least one point in each of the six games in the series, and has a seven-game playoff point streak with four goals and five assists. The Sharks are 5-4 all-time in Game 7’s. It will be their first since the first round of 2014 when they lost at home to the Kings.